Water running or water jogging usually takes place in a deep swimming pool. 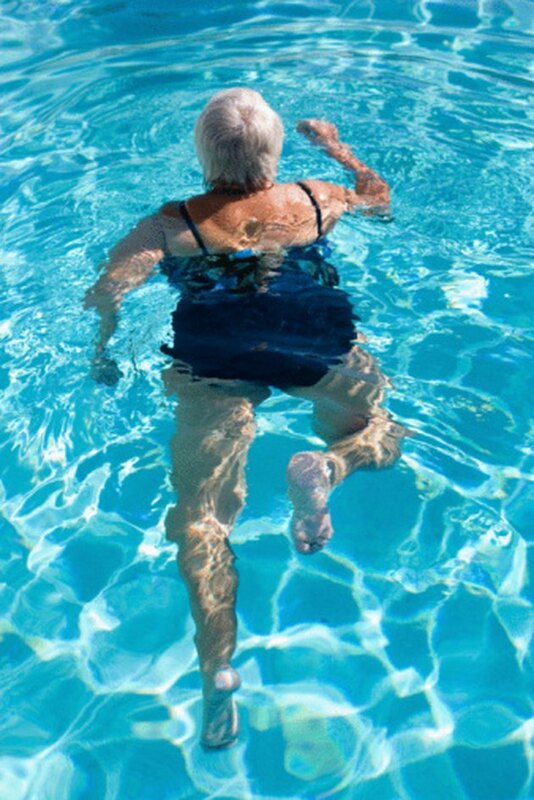 You mimic the movements you make running on land in order to move across the length or width of the pool. Elite athletes, such as British marathon champion Paul Radcliffe, use water running to recuperate from injuries sustained in their sport. Water running tests your endurance and fitness, increasing oxygen consumption and heart rate without putting weight and strain on your joints. Even though water running might not feel as grueling as running on land, it does require a lot of energy. According to Dr. Robert Wilder, physiologist and director of sports rehabilitation at the University of Virginia in "The Sunday Times," water running burns 11.5 calories per minute. Using this figure, water running for 30 minutes will burn about 345 calories and an entire hour of water jogging will burn about 690 calories. The exact number of calories you burn is also influenced by how much you weigh. The NutriStrategy website states that your burn 654 calories per hour if you weigh 180 lb. and 573 calories per hour if you weigh 150 lb. Water running does not build bone strength because it is a low-impact exercise. MayoClinic.com advises that you supplement water running with some weight-lifting exercises. Resistance or weight training builds lean muscle mass, strengthens bones and increases your metabolism level.